"Don't wet your toothbrush after you put toothpaste. Water will reduce the healthy benefits of toothpaste." Is it true? If it is what does actually happen? 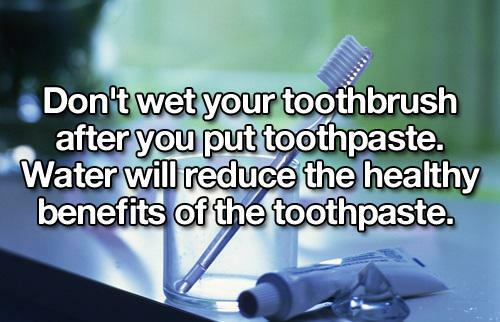 No, water actually improves the positive effects of brushing your teeth. The water activates and solubilizes the non-ionic surfactants and detergents in the toothpaste. These both cleanse the mouth, fight bacteria, and enable more even spread of the paste through the oral cavity. The water mixes with the abrasives in the toothpaste and softens their cutting power. This lets them still attack plaque while not scouring your teeth. Not the answer you're looking for? Browse other questions tagged environmental-health chemistry water . Is it good (for your health) to shower/bathe daily? Is drinking water stored in copper vessels (copperware) good for your health?